Well, it’s taken me a long time but I’ve finally built a project using cypress that I had milled from logs I felled myself back in 2006 and 2007. My blog post about Logs to Lumber described how I got Olin Barfield, a sawyer who owns and operates a Woodmizer portable bandsaw sawmill to come to my home and mill up a bunch of cypress and sycamore logs. That was back in the spring of 2010. The lumber has been sitting, air-drying, for the past three years. About a year ago I moved it into my garage and now I’ve finally managed to build something using some of the cypress. My wife and I are going to take a vacation trip next month. We’re going to Newfoundland, Canada, to visit her family. I decided to make a gift for my BIL and SIL, Sam and Mary. 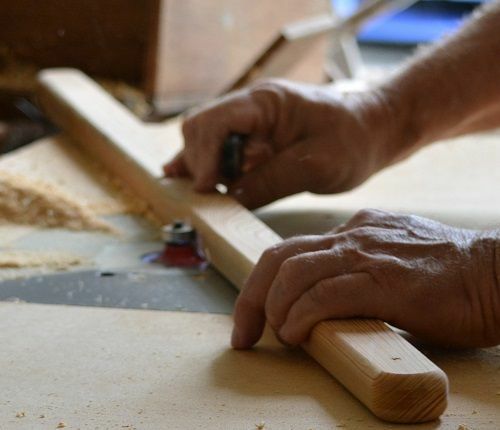 After careful consideration I decided to build a set of four Kentucky Folding Stick Chairs, using the basic design and technique detailed in Sailor’s woodworking blog. Sailor (Trip) provides a good cut list, showing all the pieces to be cut and instructions and video on assembly. I changed a couple of things on the chairs I built. Trip used construction grade 2X lumber from the Big Box Store and cut the 1 1/2” thick lumber into 1 1/4” wide strips. My cypress was milled at 5/4 and dressed out at 1” thick when fully planed. I ripped the pieces 1 1/2” wide. So my strips wound up being thinner than those Trip used. I had to add two additional pieces each of the (A) Seat, (C) Back Long and (F) Couplers so the width of the chair would be correct. Instead of wire, I used 1/8” stainless steel rod, cut to length and threaded with 6-32 die to accept stainless steel nyloc nuts. I used a Freud 3/4” Quadra Cut roundover router bit to round the ends off all the sticks. I used a Freud 3/8” Quadra Cut roundover bit to round the edges of all the sticks. The Freud Quadra Cut bits have extra cutters designed to provide a smoother profile cut. I think they’re worth the premium prices because the profiles cut in the cypress were smooth enough they did not require sanding. I did sand all the flat surfaces of the sticks. I used 80 grit Abranet on a ROS. I had to use just one disk to sand all 124 pieces. That disk was still cutting good when I finished sanding the sticks. 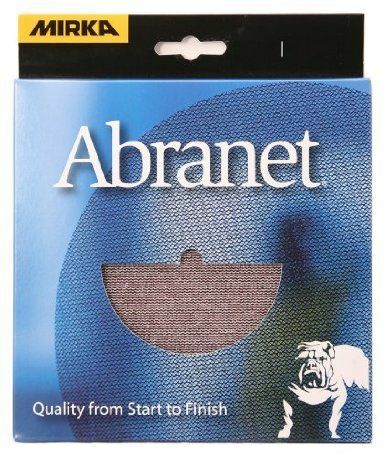 If you are going to use Abranet disks on ROS with Velcro hook and loop fastners, be sure to get an Abranet Protective Pad. 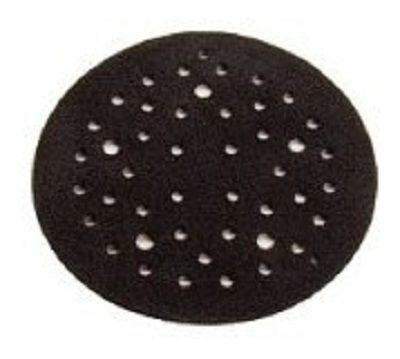 If you fail to use this, the hooks on your sander’s pad will push through the actual sanding mesh and will get sanded off, which will ruin the Velcro pad. The protective pad prevents this problem. I used Howard Sunwax SunShield wood protector instead of a traditional finish. It is made from Orange oils and beeswax. It imparted a slight golden color, popping the cypress grain quite a bit, and feels really nice to touch. The chair in the pictures is the first one which is also a test prototype. The parts for the rest of the chairs are finished and ready for assembly. I’m taking them up unassembled to save space in the car. I’ll just tell my BIL that it’s a kit! The chairs are very comfortable. My wife likes them but complains that she has difficulties getting out of the chair because it is low and has no arms to help stand up. I told her to just keep her seat and I’ll get the next round of drinks. I need to get around to making one. Especially since I am in KENTUCKY! ha… I love Cypress too. Very nice chair. Great use of the wood. Great write up and a good looking chair. It’s on my list of things that I never seem to get around to building. Thanks for the tip on the stainless steel rod and threading. 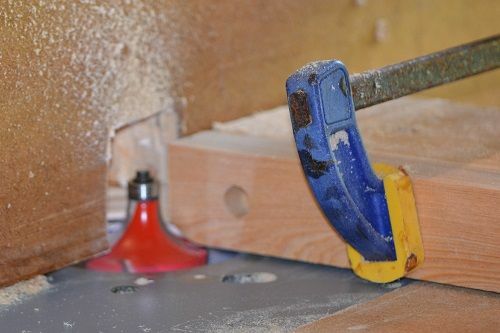 This makes for a much smoother and safer fastener. Nice job! I will be sure to share this posting with Olen next time he is over our way. Have a safe trip and enjoy! ParksArt: I have a problem with completing things. This project was very straight forward and rewarding. Cypress is a good choice for this design. WayneC: Thanks. I really like the cypress and I have quite a bit left (more than 1000 BF) for more projects. Rick M: Thanks. Now go out and build one of your own! TerryDowning: I bought the rod from McMaster-Carr (“1/8 stainless steel rod) in 6’ lengths. You need one length per chair. You’ll need a good HSS die to cut the threads. I used this one I broke the threads on the cheap set I got from Lowe’s… You’ll also need a cutting lubricant, I used this one. I bought the nuts and washers from Lowe’s, probably should have ordered them from McMaster-Carr when I ordered the rods. RWJones: Thanks, Roger! Tell Olen I said Hi!